Greenwood Connections - Assisted Living, Skilled Nursing, Adult Day Care, Home Health, Menahga, Park Rapids, MN, Minnesota - Welcome to Greenwood Connections! Green Pine Acres provides out-patient physical, occupational and speech therapy services. Registered and certified therapists provide you with the care and support that you will need to reach your goals, help you to improve your functions or return you to your previous activities. Physical therapy is a type of treatment you may need when health problems make it hard to move around and do everyday tasks. It helps you move better and may relieve pain. It also helps improve or restore your physical function and your fitness level. Occupational therapy may help you participate in the things that you want and need to do through the therapeutic use of everyday activities (occupations). Common occupational therapy interventions include helping people recovering from injury to regain skills, and providing support for older adults experiencing physical and cognitive changes. Speech therapy is a treatment program designed to help patients regain and increase their ability to communicate through speech. 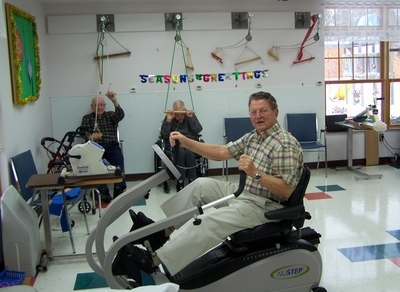 Greenwood Connections has as its purpose to affirm the value and worth of all people by caring holistically (physically, emotionally, socially and spiritually) for the aging and disabled adults in a competent and loving environment. © Copyright 2019 Greenwood Connections, Inc. All rights reserved.